If there is one thing I’m allergic to when I’m shorting a stock it’s a high borrow fee. 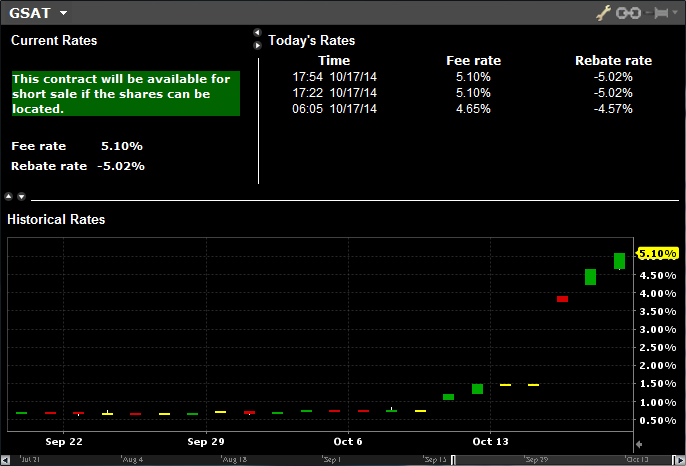 When I started shorting Globalstar earlier this month the borrow rate was below 1%. Unfortunately that is changing and at the moment you already have to pay more than 5% to borrow to stock. Because of that I have exited my position today after already reducing it two days ago (when the borrow fee started to rise). My timing is a bit crappy compared to what would have been possible in this time period, but can’t complain with a 27% return in less than two weeks. This entry was posted in Portfolio and tagged GSAT on October 17, 2014 by Alpha Vulture. No position in GSAT at the moment, but I’m a little surprised by your reasoning here. Covering because it’s rallying and you’re worried about getting squeezed in a crowded trade might make sense for risk management, but why highlight the borrow cost? As negative rebates go, 5% is pretty manageable. It works out to ~$0.01/share per month. For now at least that’s still a rounding error; less than transaction costs. And with no new borrow available at the moment, you may not be able to put a position back on later if you still believe in the thesis. I don’t think 5% is a rounding error. I think creating alpha is incredible hard, and creating more than 5% alpha annually is not something I want to bet on. But that is exactly what you are doing if you are short something like this. I’m also not worried about not being able to get back in this trade if I want. A low borrow almost automatically implies plenty of shares available for shorting. PS. My transaction costs were $0.0017/share, that’s a lot less than the $0.01/share per month you would be paying as a short. PS2. And a high borrow is of course not only bad because you are paying a lot, it also increases the risk of a short squeeze or a forced buy-in. Good points. I would (and did) only short something like this expecting a return much greater than the borrow cost. It’s just one more factor in the risk reward equation. If you think Kerrisdale is right and GSAT could be a zero in 1-2 years, then your potential return is 90-95% instead of 100%. That’s still compelling. Less so of course if you feel the risk to the upside was much higher or the downside less extreme. I’m curious where you draw the line? It obviously depends a bit on how solid the short idea is, but I need a good reason to pay more than 5% annually for a short. You certainly have to account for the fact that you will be wrong some percentage of the time with your short ideas, or you could be right but someone else buys the company before the thesis can play out or it just takes way longer than you expect. On average I doubt that you will make a lot of money shorting stocks with a high borrow fee. Not only because of the fee, but it also implies that the short thesis is known by a lot of market participants and that it is incorporated in the price to some degree.